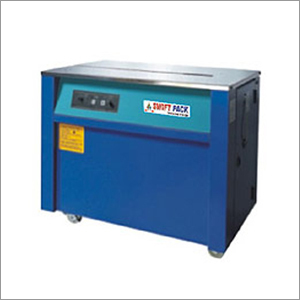 The version or model of semi automatic strapping machine (feather touch) manufactured and provided by Shri Vinayak Packaging Machine Pvt. Ltd. is one of the best in the industry. Over the years, this machine has become the economical choice of clients, who use it for its high performance and less maintenance. This strapping machine is ideal for limited strapping usages. Its design is versatile and hence is applicable to all general industrial applications, especially printing, foodstuffs, and light industry. The straps in this machines are made of polypropylene, and it has latest clutch cams transmission. This semi automatic machinery is appreciated for its easy and dependable PCB and control components, simple operation, hinged table top, closed cabinet, mechanical tension control, and motor shut-off for high energy savings. You can choose this model on the basis of strap width, speed, machine tension and dimension. Also, consider you application's specific requirements before inquiring this machine.